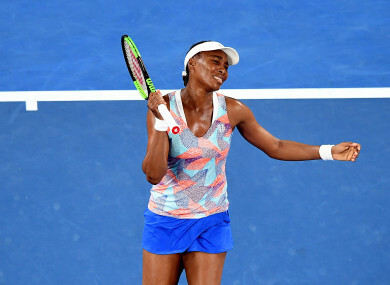 Venus Williams reacts after losing to Belinda Bencic during the first round of the Australian Open. VENUS WILLIAMS AND US Open champion Sloane Stephens led a string of seeds sent tumbling out of the first round of the Australian Open in a calamitous day for American players. “I don’t think I played a bad match. She just played above and beyond,” said 37-year-old Williams, seeded five. 20-year-old Bencic said featuring with Federer at the Hopman Cup had helped a lot, with the Swiss legend giving her advice and tips. “I think all the week it was so great learning from him on the court or off the court,” she said, adding she spoke to him briefly after her match and he “was very happy for me”. With Stephens also sent packing, it was a bad day for the United States, in stark contrast to the last Grand Slam of 2017, when they all made the semis at the US Open, leaving the women’s draw in Melbourne more unpredicable than ever. The 2014 runner-up in Melbourne and 24th seed Dominika Cibulkova of Slovakia also departed, 6-2, 6-2 to Kaia Kanepi of Estonia. And the US misery was compounded on the men’s side with 16th-seeded John Isner being toppled by Australian Matthew Ebden. Other seeded casualties included 2017 US Open finalist Kevin Anderson, who was bundled out a in a five-set thriller by Britain’s Kyle Edmund. Third seed Grigor Dimitrov survived, breezing into the second round, as did 10th seeded Spaniard Pablo Carreno-Busta. The struggling Stephens put in an error-strewn performance on an overcast and windy Melbourne day and has now not won in eight matches. “I’m not going to get too down,” she said after her 2-6, 7-6 (7/2), 6-2 defeat. There was better luck for French Open champion Jelena Ostapenko, who saw off Francesca Schiavone 6-1, 6-4. The seventh seed raced through the first set on Rod Laver Arena against the veteran Italian who was bizarrely wearing a back brace on the outside of her shirt, before a tougher second set. World number two Caroline Wozniacki, who lost to Goerges in that New Zealand decider, plays later today, along with men’s top seed Rafael Nadal. Sixteen-time Grand Slam champion Nadal insists he is feeling fine despite struggling with a knee injury and ready to go deep at an event that he has only won once — in 2009 — among his string of major triumphs. Nadal, who faces the Dominican Republic’s Victor Estrella Burgos, lost an epic Australian Open final last year to Federer, who gets his campaign under way tomorrow. Fellow multiple Grand Slam winner Novak Djokovic, seeded 14, also starts tomorrow, along with former world number one Maria Sharapova and top seed Simona Halep. Email “Williams and US Open champion Stephens both suffer shock defeats in Australian Open first round”. Feedback on “Williams and US Open champion Stephens both suffer shock defeats in Australian Open first round”.